Fertilizer and Weed Control 101: A lawn full of thick grass deters weed growth. This is because weed seeds hiding in the soil need sunlight to sprout. Using your lawn itself against weeds is pretty simple. Just raise the blade on your lawn mower a bit to keep your grass taller. Then, the grass will shade the soil and prevent weed seeds from germinating in the first place. Pre-emergent herbicide products prevent weed seeds from sprouting. Having a pre-emergent fertilizer and weed control product applied to your lawn in the spring will discourage weed growth throughout the rest of the year. Applying just the right amount of fertilizer encourages grass growth but will not boost the weeds in the same way. Healthy, thick grass is itself a great weed deterrent. Knowing how much and when to water is important. It seems like an extremely basic task, but most people water their lawns incorrectly. Grass should be deeply watered once or twice a week. Short daily watering sessions do a lot more good for weeds than grass. This is because quick watering encourages shallow root growth and promotes weeds that are adapted to dry soil conditions. And too little water will kill off the grass and make room for more weeds. The types of weeds that are present will explain a lot about what’s wrong with your soil conditions. If wet-soil weeds dominate, then aeration and increased sunlight are in order. When dry-soil weeds are prevalent, then it’s time to increase the amount of water and length of the grass blades. If you are an Atlanta-area homeowner who’s tired of looking at weeds in your lawn, then Kemko Lawn & Shrub is ready to help. For over 30 years, our family-owned company has helped people all over Atlanta with their turf, weed, shrub, and tree maintenance needs. Our turf programs make fertilizer and weed control second nature, with seasonally scheduled treatments and applications to keep your lawn looking great year-round. 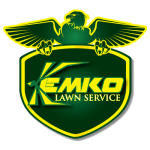 Kemko Lawn & Shrub knows the best fertilizer and weed controlling products for your type of grass. With proper aeration, watering, and lawn care products from the Atlanta pros, your lawn will be the best on the block in no time. weed control treatment Your lawn will thank you, all year long!